Very cool! This reminds me of two things: (1) I’ve been meaning to buy my kids a magnifying glass, and (2) Ben called me over last night after the kids were asleep to look at an inchworm who was clearly lost since he was on our newly primed wall. 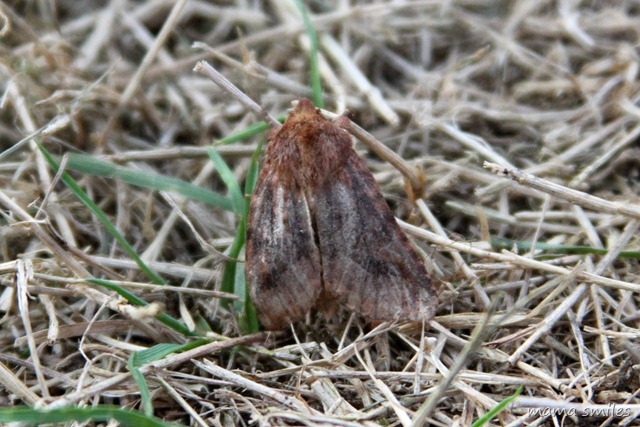 He looked like he had a piece of bark on his back and would have blended perfectly into a tree trunk. The “bark” disguise was 4 times his width and nearly as long as he was. .-= Elisa | blissfulE´s last blog ..gardening without work – 1st garden update =-. @Elisa – magnifying glasses are so much fun for little kids! And that inchworm sounds really cool! Note to self, remember to take magnifying glass outside. Kids would love it. .-= Ticia´s last blog ..stART- We’re Going on a Ghost Hunt =-. I love how Lily had to be in on the action too. 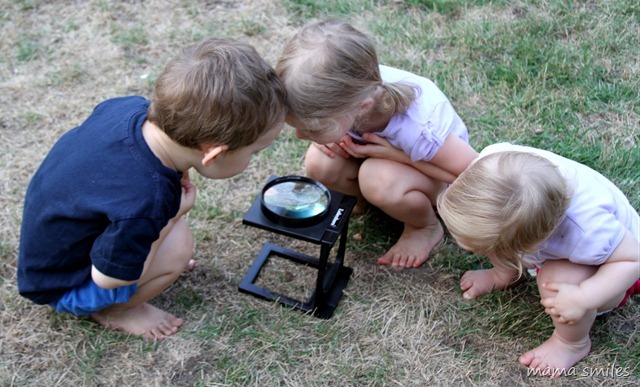 Magnifying glasses are such a useful tool for outside exploration. I keep thinking of getting Anna a better glass than a cheapo one that she has, but she seems perfectly happy with it and I am not worried about scratches and such. .-= Natalie´s last blog ..We Play With Water =-. @Natalie – We really like this one, if you do decide to get her a nicer one – and it’s less than $10, which was cheaper than some similar ones I was looking at. @Ticia – It keeps my kids occupied for a LONG time outside! Isn’t it great the way we can learn so much in our own backyards! I like the big magnifying glass. Do you remember where you got it? .-= jeannine: waddlee-ah-chaa´s last blog ..Devilishly Delicious and Easy Pumpkin Muffins- FREE printable recipe guides for children =-. 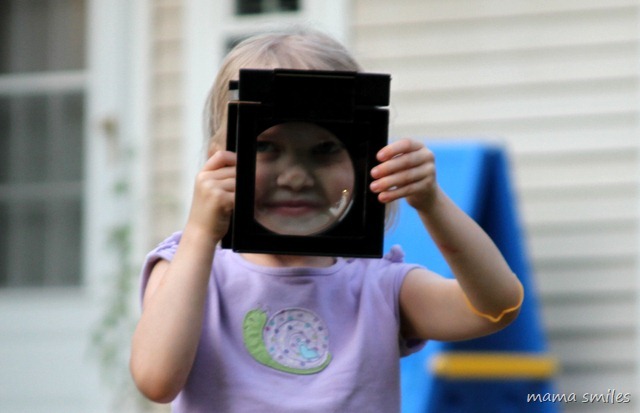 @jeannine – It’s called the Big View Magnifier from Lakeshore Learning. I tracked it down after seeing it on another blog! That is an awesome magnifier! .-= Our Nifty Notebook´s last blog ..CSN Stores Product Review- Virco Student Desk &amp Chair =-. Magnifying glasses outside are so much fun. I once remember reading an idea where you use some masking tape to “draw” a square on a particualr area whether it be a tree trunk, a patch of grass etc and then use your magnifying glass to see how many different discoveries you can make within the square. We are yet to do this. We have that same progression – all serious and focused and then it gets silly :). Some great learning can still happen when we get silly. Your pictures of Lily are adorable, she looks like she has a bubbly personality. Emma’s drawings are very impressive. I can imagine that this must be a special father daughter time when your two artists draw together and create not only special pictures but precious memories. How awesome that it turned into such an educational time with a bit of silliness added for extra flavor! .-= Jen´s last blog ..Birthday Paintings =-. We love exploring with our magnifying glass too. Yours is much bigger – how fun! Wow–I agree, that is a very cool magnifying glass. I might add it to our Christmas list. And I’m sorry, but I had to laugh about their experiment bending it in the wrong direction. It’s very much something that would happen in my house. .-= Two Chicks and a Hen´s last blog ..How We Celebrate Half-Birthdays =-. There is no better activity here then when we pull out our magnifying glass. Selena just absolutely loves using hers. What a great way to explore camouflage! It’s amazing how crazy magnifying glasses can make kids – but then, I enjoy running all over the yard with them, almost as much as the kids do! .-= Almost Unschoolers´s last blog ..The Mystery Tree Revealed – Fall Science For Children =-. I love when those teachable moments happen. It makes learning so much worth while. .-= Tami´s last blog ..Spider Math =-. This is a really good Science lesson, but my favorite thing is the last picture of Emma:-). .-= Susana´s last blog ..BOB Books Winner =-. @Susana – I love that photo too – she’s such a ham! 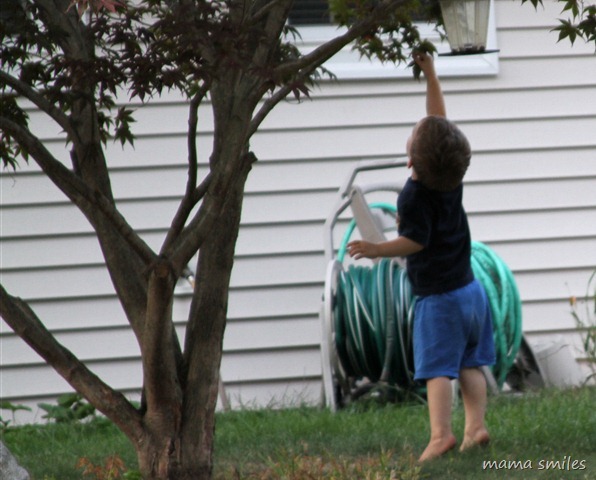 My son loves roaming the yard with his magnifying glass too. .-= JDaniel4’s Mom´s last blog ..ReadExploreLearn-Fire Safety =-.